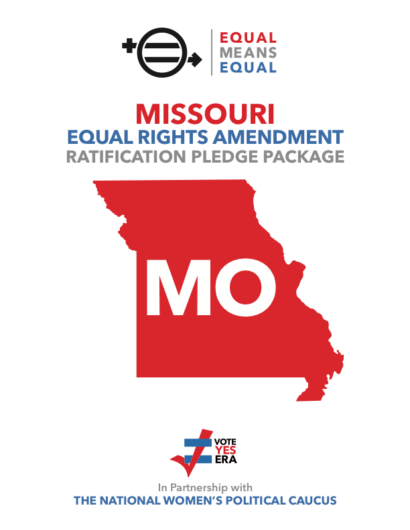 Natalie and I just returned from testifying to the Missouri Senate on behalf of the Equal Rights Amendment. It was a highly tense affair, appropriate given the gravity and stakes of the moment; the gallery filled with Missourians and press. Senator Jill Schupp opened the hearings with a strong statement on the importance of ERA ratification. Then she was questioned by the Committee members regarding the deadline, the viability of the ERA, etc. Our takeaway: there is a great deal of misinformation and outright lies surrounding the ERA. Educational work needs to be done immediately in this area especially among ERA proponents and Democratic legislators! The main contention of the anti-ERA activists is that the ERA will lead to unfettered abortion on demand; that the ERA is in fact, a hidden free-abortion-to-all bill. It is, frankly, an obsessive concern that flies in the face of facts, the present law and, most importantly, detracts and devalues ALL the ways in which ERA will save and improve the lives of every single American. Unfortunately, there have just been lawsuits filed (Planned Parenthood/NWLC) that attempt to do exactly what the anti-ERA activists are saying: connecting state ERAs with abortion. From the point of view of those of us fighting to ratify ERA, this is the worst possible time to see if this argument works – it will absolutely be used by the anti-ERA side to validate their claims that the ERA is all and only about abortion, WHICH IS NOT THE CASE. Additionally, the arguments made in the hearing by anti-equality activists that the pro-ERA side has already granted that the original ERA is dead by introducing start-over legislation is of concern; as is the confusion around speaking about the deadline. But we can do something about this now, before these arguments continue to be used against us in the unratified states. We believe it is necessary that the ERA community get wholly behind the strategy of completing the original ratification of ERA by achieving the final 38th state first, as an a priori action. We need just one more state to try it this way – the easiest way, the fastest way, the way that respects the history and the millions of women who have worked for hundreds of years to get us to this moment. Dividing the focus is extremely detrimental and is playing into the hands of those who would see this matter go away. It confuses what is extremely clear: we need 38 states; we have 37. Once the 38th state is ratified, Equal Means Equal believes there is no need for additional Congressional action; the amendment is adopted – as per Article V and the letter from the Archivist. But if this is not the case, we will deal with it. We cannot inure ourselves from future pain by avoiding action today. We cannot let the fear of “what they could do” stop us from doing what we know should be done. What we know is right. We must pass the ERA now, in 2019, by ratifying one more state. If the ERA is adopted and anti-equality activists file lawsuits to say it is invalid, this will go through the courts and, in all probability end up in the Supreme Court. 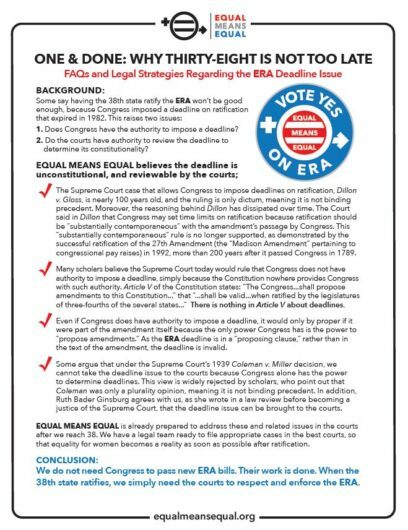 If the Supreme Court then rules that our ERA ratification is invalid, we may find that we do need to extend the deadline or remove it or start over. But that ruling is a long way from today. And during thetime it is being argued in the courts, we will continue to build a massive pro-ERA movement and build the public awareness we need to succeed. So let us join together now and focus on getting ONE MORE STATE TO VOTE YES. Please see the below Legal FAQs and spread this important information to combat the rampant disinformation out there about the status of the original ERA. After we achieve the 38th State, the ERA will move into a new phase. Some of it we can anticipate, some of it we can’t. But until we get there, we won’t know what we are dealing with. So, let’s get there– we can deal with anything together. If you are able, we would appreciate funding to expand our educational campaigns in these states.